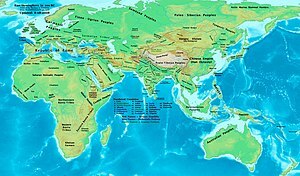 The eastern hemisphere at the end of the 2nd century BC. The 2nd century BC was a century that started the first day of 200 BC and ended the last day of 101 BC. It is considered part of the Classical period of history. After having won the Second Punic War, the Roman Republic continued expanding by conquering neighbouring territories. It eventually made Greece part of its empire. It also took the coast of North Africa after destroying the city of Carthage at the end of the Third Punic War. In the east, the Seleucid Empire was forced to make concessions to Rome in order to avoid war. Rome came to dominate the Mediterranean Sea during this period. By the end of the century, its army changed from conscription to a voluntary professional force. These changes were known as the Marian Reforms. In East Asia, China became very successful under the Han Dynasty. Its empire extended from Korea in the east to Vietnam in the South to the borders of what is today Kazakhstan in the west. The Han also try to get help in fighting the Xiongnu from the Yuezhi people in the west. It is also during this century that the first paper is made in China. This page was last changed on 8 February 2016, at 05:07.